This is a very unique property. 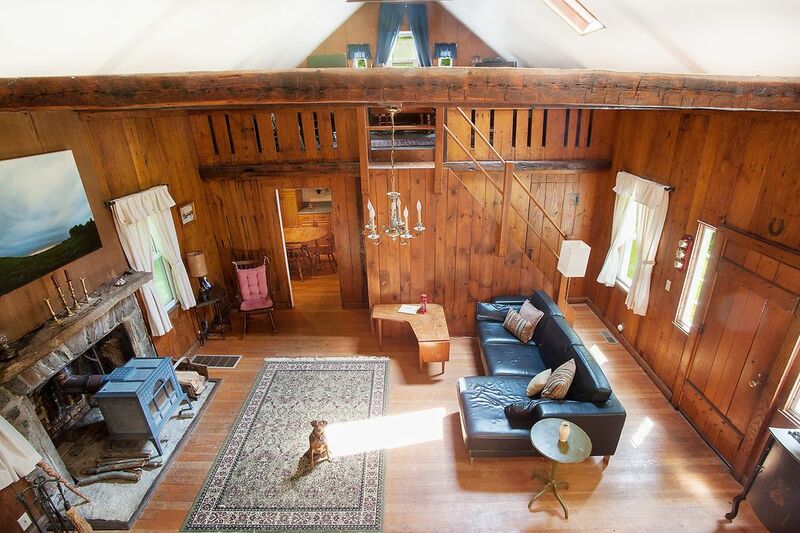 It is a converted ice house (originally built in 1840s and converted in 1940s) complete with thick oak-paneled walls, fieldstone fireplace and lofts. It sits on an acre of wooded property and is very private. It is a short walk to the waterfront on the East Side of third bay of Highland Lake just down the road. The waterfront area is a peaceful little piece of forested land right on the water with a dock and swimming area. If you have a motorboat, you can tie it up safely at the dock. You can also launch our canoe or row boat from there. It's the best of both worlds - you can swim and paddle all day but then unplug from the lakeside hubub, return to the woods in the evening and relax with the sound of crickets and toads. I am a producer working in NY and Los Angeles. I grew up in CT and spent my summers on Highland Lake. My family is still on the lake and I get back home every chance I get. It is my favorite place in the world. Because I spent all my childhood summers on Highland Lake and I love it there! I am a fan of the Northwestern corner of CT, Western Mass. and Eastern upstate NY. There are so many artists in nearby Duchess County, music and theatre and art in the Great Barrington/Lenox area. CT has such beautiful hikes (The Appalachian Trail runs along the nearby Houstatonic River), fly fishing, great roads for motorcycle rides. And the pizza is unparalleled!!! It's SO CLOSE to NY but feels SO FAR! It's a great balance of access to water sports and access to pristine nature. I get such a sense of peace and enjoy the nature and the community when I'm there. Tanglewood nights are so fantastic. The bike path along the Farmington River is exquisite. The weather is always so great there - even when it's unbearably hot everywhere else. What a lovely place! A really interesting and stylish house with all comforts provided. We loved the jetty and kayak - we kayaked to Winsted and explored the town. It was a long way home but we made it! This house did not meet our expectations for cleanliness based on previous and subsequent stays at other VRBO rentals. In our experience, the interior of the home was not up to rental standards. To us, it felt like we had entered somebodies old unkempt and cluttered house. The pictures in the ad didn’t reflect the house as it was when we rented it. Additionally owner charged us for breaking a piece of furniture in a room we didn’t use and did not refund our money when we told her we were never in that room. He said she said and no proof but truth is we were never in the room. I hate writing a bad review and waited quite a while to write this from when we stayed to get some distance and perspective but it didn’t change my review. The house really has potential but could use a really good cleaning out and a decorator. This tenant's review is inaccurate. The housekeeper reported a broken chair upon checkout and I inquired with the tenant to investigate. When the tenant stated that they did not break the chair, I offered to check with the housekeeper and, if there was an error, refund the deposit. This tenant's deposit was, in fact, returned. What is truly disappointing is that this tenant did not make any complaints about the house until after I inquired about the damage the housekeeper reported. In fact, they wrote an aggressive and abusive email to me after my query which included a litany of complaints that they did not voice until after the housekeeper reported damage. I met the tenants myself upon check in and my family, who manage the house, are available at all times to address any issues. There were no complaints at all during their stay. It is clear to me that this complaint is retaliation for my query about the damage reported to me by my housekeeper. It is unfortunate to me that this tenant feels this sort of dishonest and malicious behavior is justified. Again, the deposit was returned by VRBO so the claim that it was not returned is a misrepresentation and wholly untrue. Great place - peaceful, cozy, clean and a great feel! We loved the place! Impressed with all of it. The one thing I was taken aback by was the fact that the cabin is not right on the lake. I assumed it was, but maybe I overlooked that fact. Nonetheless, it was only a 5 minute walk to the lake and there is a private dock, which was wonderfully awesome! Highly recommend it! Great BBQ place close by - Zach and Lou's! Everyone you run into around the lake and in town, extremely friendly and kind! Overall, a wonderful, wonderful, awesome place all around! It was perfect! Clean, cozy and peaceful . We loved it and will return. Highly recommend it. The owner is very nice. What a wonderful cabin in the woods! Vey quiet and peaceful. Loved the decor of the cabin! We had such a nice time here. Everything was available for us - like we were right at home. Very clean and cozy! Loved the peace and quiet of the woods. Would recommend this cabin to anyone who loves nature and the woods! I would stay her all year if I could!! Thank -You Maryann and family for letting us enjoy your beautiful cabin in the woods!! Non-Summer holidays (Thanksgiving, Christmas, New Year's, Easter) are $150/night with a three night minimum. There is an additional deposit (refundable) if you bring a pet. $100 per pet.